The story is a familiar one: the saga of a loving parent’s quest to save a child. This time it’s about the mother of a boy with autism. The mother scours the medical literature in search of any kind of treatment, however far-fetched and experimental. She finds one that seems promising, something involving magnetic fields, and moves mountains to get it for her son as part of a research protocol. Then, seeing that it helps, she devotes herself to getting more of it. Ultimately the mother starts a foundation to promote research into the new treatment, hoping to prove its value and one day make it part of standard care, not just for her son but for other children with autism, too. This particular version of the story, though, is tinged with irony. The treatment in this case is transcranial magnetic stimulation (TMS), and the mother is a Minneapolis woman named Kim Hollingsworth Taylor. In 2012, Taylor’s son, age 14 at the time and on the high-functioning end of the autism spectrum, was part of a trial of TMS that seemed to relieve a few of his autism symptoms for several days, making him able to read social cues more accurately and to complete cognitive tasks in far less time than before. We all carry an invisible frame of reference in our heads that filters our experience, shaping the way we see each other and the world. This week’s episode of the NPR podcast and show Invisibilia explores what happens when that frame of reference gets turned upside down — in one case by a brief encounter with a powerful magnet. Pleased with the results, Taylor found a way the following year for her son to get more treatments in Boston, twice a week over the course of 10 weeks, even though TMS had not been approved by the Food and Drug Administration for autism symptoms (and still has not). During this time, Taylor says, her son’s autism symptoms disappeared, and he went from being a boy with no friends to being a boy who was asked to the homecoming dance by four different girls. The change thrilled her so much that she started a small nonprofit to advance research into the use of TMS for autism. Taylor, who has a background as a financial analyst in the medical technology industry, called the foundation Clearly Present, the phrase her son used to describe how he felt after treatment. “It’s like there’s more of me here now,” he told her. But the benefits began to fade after just a few months. Now, three years after his last treatment, Taylor’s now 18-year-old son is back to where he was before he started on TMS. And he says he doesn’t want to try it again if it means again disrupting the family life and moving to Boston with his father for another three-month stretch. So here is Taylor, committed to organizing scientific conferences and soliciting research funding through the Clearly Present Foundation, with the personal impetus for her labors having disappeared. “Like most people I would crawl on broken glass to make things a little better for my kid,” Taylor said in a recent phone interview. So she finds it “profoundly sad” that there’s no place closer to home that could offer TMS to her son — and frustrating to be in the midst of a demanding volunteer project that, for now at least, doesn’t seem likely to help her own child. In an article on TMS for Spectrum, a web magazine about autism science, the writer Lydia Denworth called the story of the Clearly Present Foundation “a cautionary tale for anyone who reads too much into TMS’ benefits.” Another cautionary tale is featured in the latest episode of NPR’s podcast and program Invisibilia, about a middle-aged physician on the autism spectrum who also tried TMS. The treatment, which the woman (also named Kim, but not related to Taylor) underwent twice, enabled her to perceive subtle emotions in others for the first time in her life. Then, after less than an hour, that insight disappeared. How did she feel about getting this brief insight into how most people experience feelings? “It could be that you would get a glimpse of this and you couldn’t have it, and it would be completely heartbreaking and you couldn’t get over it,” she told Invisibilia host Alix Spiegel. But after reflection, the physician told Spiegel, her feelings were mixed — depression, yes, but also gratitude that she’d had a chance to gain a deeper understanding of what it means to be human. Autism is a developmental disorder that can be disabling, and there’s no cure. That makes families uniquely vulnerable to the potential of untested treatment. The fear is that TMS could turn out to be the latest in a long string of untested or off-label treatments for autism, from chelation therapy to hyperbaric oxygen chambers to gluten-free diets, that desperate parents have been spending money on for decades. It’s easy to understand the enthusiasm for a treatment like TMS, which is non-invasive, non-pharmacological, and already has FDA clearance for one condition —severe depression that doesn’t respond to other treatments. It has few known side effects, though it has been shown, in very rare cases, to cause seizures. “I know it’s easy to get overly optimistic given the media coverage and web posts about the remarkable responses some people with autism have reported after participating in a TMS study,” Oberman, a research psychologist at Brown University and Bradley Hospital in Rhode Island, wrote last March in a blog post for the advocacy group Autism Speaks. But those studies have been very few — just 13 in the medical literature to date — and they tend to focus on only a select group of subjects: adults, generally male, who are high-functioning and do not have epilepsy. It’s risky, then, to generalize to how TMS would affect women or children with autism, or people with more severe symptoms. 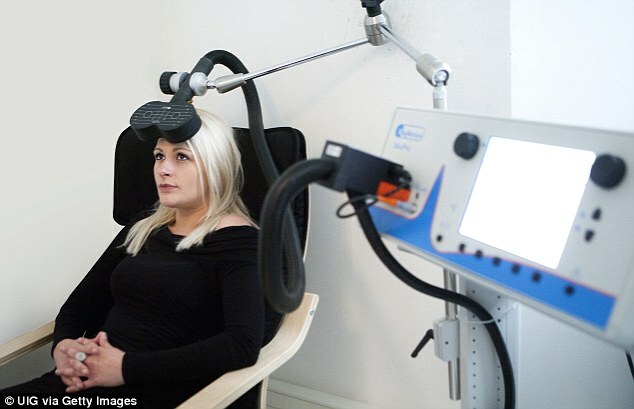 Author and autism activist John Elder Robison took part in a study of TMS (transcranial magnetic stimulation) at Boston’s Beth Israel Hospital in March. “I caution against drawing conclusions from the preliminary results of the TMS studies that I and others have conducted,” wrote Oberman in her blog post. Among those 13 trials of TMS for autism, which involve fewer than 200 people altogether, only one is a double-blind, randomized trial — the type of trial designed to rule out the so-called placebo effect (improvements that occur because subjects expect them to). In the double-blind study, conducted in Australia on 28 high-functioning adults diagnosed with autism or Asperger’s syndrome, the 15 people in the treatment group showed some improvement, compared to the 13 controls, in terms of better social skills and reduced anxiety, both immediately after the treatment and at the one-month follow-up. The real excitement over TMS for autism, however, does not come from the medical literature. It comes from popular testimonials of people on the autism spectrum who credit TMS for heightening their emotional sensitivity and leading to fewer obsessions, fewer repetitive actions, and improved social skills. John Elder Robison, an author and autism activist, describes his own experience in hislatest book, Switched On: A Memoir of Brain Change and Emotional Awakening. The alterations of TMS were life-affirming, he writes, but they were tinged with sadness, too, because his insights into others’ emotions showed him how troubled most people’s inner lives really are. But while Robison says his heightened emotions have generally persisted in the eight years since his first treatment, even his doctors say his response is unusually robust. It’s easy to see why parents would grab at cures that promise to bring back their sons and daughters, to give their children a voice, stop them from self-harm, or offer them a chance at friendship and independence. But quite apart from the question of whether the traits of autism are symptoms to be treated or differences to be embraced — a debate at the heart of the neurodiversity movement — Oberman says it’s too soon to institute TMS as a treatment, especially for children, whose brains are still developing. It’s difficult to predict the long-term consequences for children of routinely disrupting their brain activity. And it’s hard to know, for children and adults alike, the details of how best to offer TMS for autism: how often it should be used, for how long a period, in which regions of the brain, and for what purposes. In other words, scientific evidence about the efficacy of TMS in autism is not in yet, and it’s accumulating the way most scientific evidence does: with painful slowness. Among the still-unanswered questions about TMS is how it works and which autistic behaviors it best targets. Put ten clinicians in a room, Oberman says, and you’ll likely get ten different answers. Her own research interest is in social communication, she says, but other symptoms — poor executive functioning, depression, irritability, poor language skills — are just as likely to be affected. Hollander has found TMS useful for relieving such autism symptoms as agitation, self-injury, and behavioral rigidity. But he says many questions about TMS for autism are still unanswered, including which brain regions to target, the optimal frequency and duration of treatment, and the best schedule for booster therapy for long-term maintenance. In addition to all these questions about how TMS should be used, scientists don’t really know much about who the best candidates for TMS are. Is it best aimed at those on the high-functioning end of the spectrum? Only for adults? Only for those without epilepsy or other co-existing problems? And what are the ethical implications of recommending TMS for a use not approved by the FDA? Even though it is legal (doctors can prescribe any FDA-approved drug or device for any purpose, not only the purpose for which it was originally approved), that does not make it the right thing to do. One way to answer these questions is through a multi-center therapeutic trial of TMS for autism, something that Kim Hollingsworth Taylor and the Clearly Present Foundation have been trying to help organize. But clinical trials are expensive and would require a major grant, which members of the coalition of researchers Taylor has assembled, known as the TMS Therapy for Autism Consensus Group, have spent the past two years trying to obtain. They’re talking now about first coordinating a number of pilot studies at individual institutions, on the way to gearing up to a large-scale, multi-center clinical trial. There are already a few studies of TMS and autism underway: one in Canada is looking for improvement in executive function in 50 adolescents and young adults; another in France is looking for changes in social cognition in 60 adults; and one in Israel (the one most relevant to children) is looking for changes in social interaction in 20 children and adolescents who have autism or an intellectual disability or both. In the meantime, Oberman says the only safe way to receive TMS for autism, for adults and children alike, is by being part of a research trial — which means going toclinicaltrials.gov to volunteer to be a study subject.